Thankfully we made it back safe and sound from a very quick trip up north. 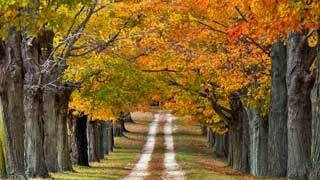 The drive was long, but very beautiful as all the leaves are changing and the air has that fall freshness. What I loved the most was watching the landscape gradually change, from evergreens to corn fields, grassy hills, and finally back to the familiar. Although I have to say, one week makes a big difference and I can definitely see fall here in the South. The temperatures are cooling down and everything is covered with a fresh dusting of leaves (that are nowhere near as colorful as those up north). Coming back after being away and getting back into ‘the swing of things’ always seems like such a difficult thing to do, until it’s done. This is especially difficult since I had to say such a quick “hello” and “goodbye” to both my parents (particularly my Mom). But we are all excited for the upcoming holidays and more opportunities to spend time with each other. So, with renewed excitement I am happy to return to helping you all again!